To a large extent Australian Rules football were inspired by British school football and also Irish football. Tom Willis, who is credited with the invention of the game, was inspired by both these forms of football. As such it is only but natural that Australian Rules football has a “code of law” which bears telling similarities with both the British high school football or rugby and the Irish football. 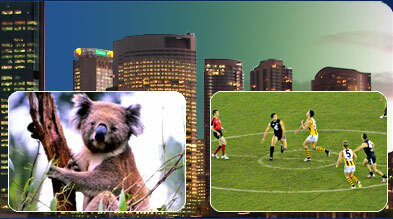 Some of the rules of Australian football have also been inspired by the game of Marn Grook, a specialty of the Australian aboriginals. The rules that were at first drawn by Tom Willis and others were named the Melbourne FC Rules after the first biggest football grounds dedicated to the game of Australian Rules football. As the game grew to become more and more professional, different clubs began adopting a modernized, professional version of the Melbourne FC Rules. The updated version of the Melbourne FC Rules was named “Victorian Rules” and was also sometimes referred to as the “Australasian Rules”. The field on which Australian Rules football is played is called a pitch which is ideally 135 to 185 meters in length and 110 to 155 meters in width. The center circle, which measures 3 meters in diameter, stretches up to 45 meters on all sides. On either end of the field stands 2 goal posts, both 6 meters in height. The ball that is generally used for playing Australian football measures about 29 inches and weighs nearly 10 pounds. The ball is coated with leather on the top. Australian Rules football usually has players playing without any apparent protection like special equipments. The jerseys are normally sleeveless with shorts, socks and studded boots. Each team consists of 20 to 22 players but only 18 are allowed to play on to field and it is a compulsion to cross the interchange line when any off-field player replaces an on-field player. There is 1 field umpire who is again assisted by 2 boundary umpires and 2 goal-post umpires. A normal rules football match continues for 100 minutes over a length of 4 equal quarters with 3 minutes interval between 2 quarters. The Australian Rules football allows a score in only 2 ways, one with a goal and the other, by scoring from behind. A goal is scored only when a rival member kicks the ball over the goal-line into the goal post, but without touching either of the goal-posts. It is considered a behind, when the goal is scored in the same way but in the process, it touches another player or is pushed into the goal-post by a defender. A behind also requires that a member of the defending team kicks the ball from within the confines of the goal square and no other player might come closer to the ball until it has been kicked; all other players need to maintain a distance of 5 meters. A toss decides which post the winner of the toss will occupy at the start of the game but posts are interchanged after each quarter. A 'bouncing the ball' takes place when the field umpire signals the start of the game by bouncing the ball in the air with prior permission of both teams. The Australian Rules football, which applies to ‘advancing the ball’, is a ‘handball’ or simply holding the ball in one hand and hitting it with the fist of the other hand. A player is allowed to run with the ball but he must bounce the ball every 10 meters. A defender wanting to tackle a rival player is only allowed to use his hips, chest, shoulder, arms or open hands but cannot tackle him under the waist or above the shoulder. A player scores a 'mark' when he is able to catch the ball after a kick from another player at a distance of 10 meters. The 'free kick' is allowed if a rival player obstructs any player at the center bounce. The last rule that applies to Australian Rules football is the 'out of bounds' rule. A ball is 'out of bounds' when the ball is completely outside the boundary line.